Pari Saikia is a journalist from the state of Assam, with five years of experience as a reporter and correspondent. Pari studied at SNDT Mumbai University and has completed a postgraduate diploma in English Journalism from the Indian Institute of Mass Communication. She has worked with the Pioneer Newspaper, Rural Connect magazine, the Statesman, and Energy Next magazine. Pari currently works as a Principal Correspondent for the Tehelka Magazine. 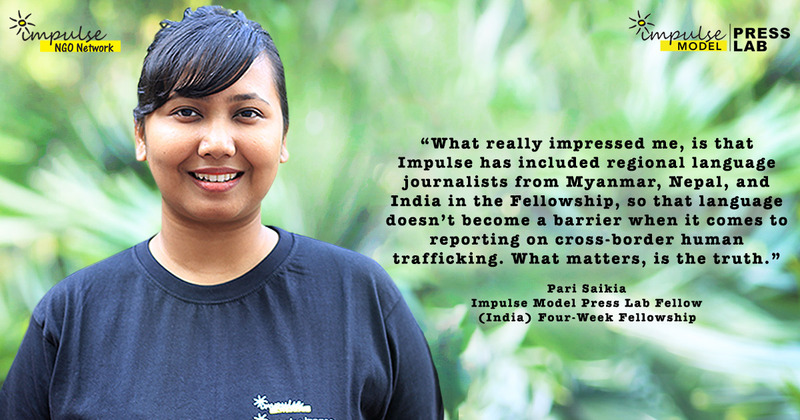 Her field research as a reporter in remote parts of Assam and in New Delhi drove her to focus on human trafficking as a journalist, and she has been reporting on the issue on a range of platforms. In 2015, Pari investigated child trafficking in Delhi’s red light area, G.B. Road, publishing an exposé in Rural Connect. In 2017, she conducted an investigation into the disappearance of children from the areas Baksa, Kokrajhar, and Chirang in Assam for Tehelka. Pari hopes to see a world free of any kind of slavery and exploitation, where human lives are valued more than their bodies.